At the heart of Puccini’s final opera, Turandot, is a series of riddles which the ice princess presents to Prince Calaf, her eager suitor. Any wrong answer would mean death. When his successful solutions fail to win her affection, he counters with a riddle of his own. And his is a wager with an equally high risk. He tells her that if she can correctly discover his name by the following day, he will die at daybreak. It is perhaps no coincidence, then, that The Tragic Fate of Moritz Tóth, a novel in which Turandot plays a pivotal role, seems to unfold as a number of riddles—or situations that are difficult to explain—that serve to lead and mislead the characters, and the reader, along the way. This short but ambitious novel by Serbian writer Dana Todorović, is one of the new titles in the third round of the Peter Owen World Series, published in collaboration with Istros Books. By employing two stylistically different, but interconnected storylines, Todorović crafts an accessible, inventive exploration of a number of classic literary themes: the nature of good and evil, predestination versus freewill, the redemptive power of art, and the soullessness of modern bureaucratic society. The result is an entertaining, thoughtful read, with a twist that few are likely to see coming. The titular Moritz Tóth narrates his own story. He is a former punk rocker with a tendency to moody melodrama, at a loss following the death of a woman he had loved. He has been though some rough stretches and his past will leak out in erratic confessions over time, but at the outset he is simply in need of a job. When the employment agency calls, he has little option but to answer. And so this most unlikely candidate ends up as a prompter for a forgetful Calaf in a run of Turandot at the Hungarian State Opera House in Budapest. However, Moritz’s first exposure to opera reawakens in him a long forgotten passion for the violin. As a child he had fiddled Gypsy tunes with his musician grandfather until, in the throes of adolescent rebellion, he had traded his violin for an electric guitar and turned his attention to punk. ‘In my youth, while on a perpetual search for new knowledge and insight, I would often wonder if there was a straw we humans could grasp at to give meaning to our lives, considering that we are deprived of the ability to penetrate the truths of our existence. The two narratives alternate, chapter by chapter Tobias faces repeated challenges against his impulsive action in a system in which honourable intentions appear to have no value, while Moritz becomes aware of a strange character who seems to be following him. This creature’s presence and the appearance of a number of signs that seem to hold prophetic significance, deepen his paranoia and anxiety. As he attempts to solve the chain of riddles confronting him, he begins to suspect he’s the victim of a diabolical plot of Biblical proportions. His wild imagination gets the better of him, threatening his rational judgement altogether. But, what is the true connection, if any, between Tobias’ action and the increasingly strange circumstances in which our hapless former punk has found himself? The exact nature of the connection remains unclear until the closing pages. Todorović manages to build a complex plot that raises some very profound questions, and present them in an original context. This is, however, a first novel and translated by the author herself. It is impossible to know how much the language might be, in such a circumstance, altered for an English speaking audience. It is worth noting that the narrative can, at times, get weighed down by awkward transitions and clichéd metaphors and similes. It is not enough to detract from what is a highly engaging tale, but it can occasionally strike a sour note. 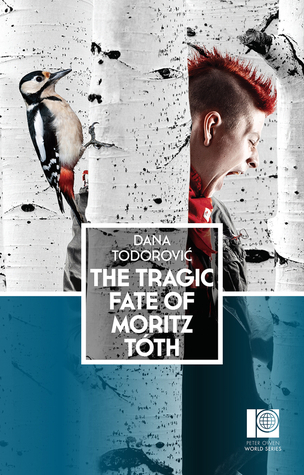 The Tragic Fate of Mortiz Tóth by Dana Todorović is translated by the author and published as part of the Peter Owen World Series: Serbia, a collaboration between Peter Owen Publishers and Istros Books.